Eeek, doesn’t that look dryer than a dry thing? It really wasn’t though but perhaps that’s because I added lots of extra dressing when I sat down to eat. So, I wanted to eat asparagus tonight because, you know, it’s in season and we love it and it doesn’t hang around for long. Then I remembered we had potatoes in the fridge that needed using up so I thought I’d put the two together. I was going to add some smoked trout but then I suddenly remembered tuna. I hate the tinned stuff but love the fresh kind, we just don’t eat it because it’s so unfriendly to the environment. I thought about reverting to the trout but there was no way that was going to cut it when the tuna was looming so large so, I ignored the little monster sitting on my solider and scurried to Waitrose to pick up said fish. We’ve done something similar to this before but without the olives. Stephen’s a big fan of the nicoise but I’m not so keen, largely due to the eggs. I keep on trying to love them but I don’t think it’s going to happen so I just left them out. He didn’t seem to mind, I added some tomatoes which is another thing we fight over and that seemed to please him. 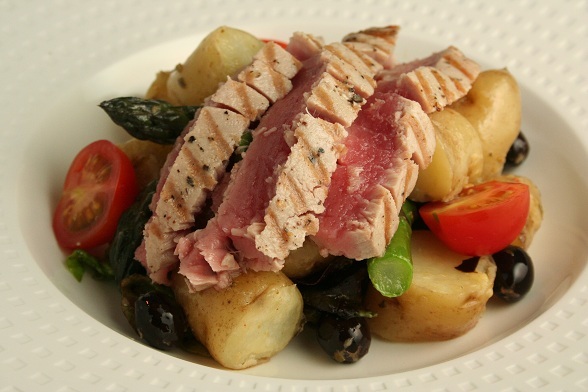 So, tuna, new potatoes, asparagus instead of green beans, olives, tomatoes, lettuce and a Dijon vinagrette. No anchovies because they’re also on the banned list and my conscience couldn’t cope with two unfriendly fishes in one night. Similar to a nicoise salad but not really. Just as good though, or better really if you don’t like eggs. Chicken would work here too (free-range, obviously), if you’re not as environmentally irresponsible as I was being this evening.